Friends…can be people with whom you go to the beach, on a walk, or just hang out with. OR…. They can be casual buddies or every once in a while one can be blessed with a close, supportive, “I have your back” type of relationship. This picture was taken a few weeks ago while I was on a Christian Women’s retreat with my childhood BFF. The group had gone to an island owned by the cruise line for a time of prayer and worship on the beach. After the singing and praising we walked along the water’s edge and saw these birds just chilling on one of the lounge chairs. 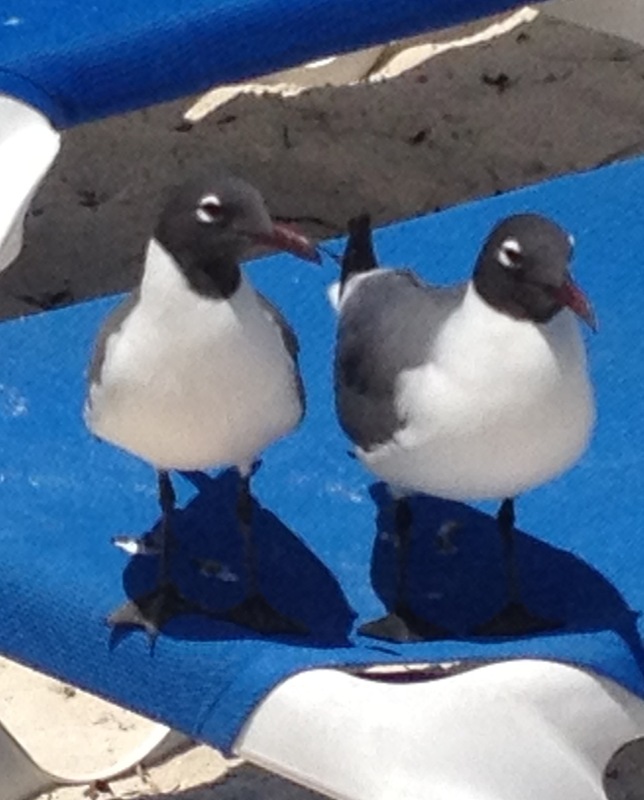 When we came too close they sensed danger or feared our presence and they took off together in flight, soon they landed on the sand, stood there and talked and talked with one another, and after a long chat they headed back to the lounge chair just to start the whole cycle over again. We laughed! Their friendship reminded us of ourselves. Hanging out, always there for one another even when one of us takes off in flight, talking it over and then resting in the knowledge that our friendship runs deep. Yes our friendship has the benefit of a lifetime of memories, but the glue that has held us together is our love for Christ. We have prayed for each other, with each other and when the other one of us was out of words and in pain…we’ve known how to lift each other up in silent prayer and golden support. Having friends who will reach out and lift you up no matter what the cost may be are a treasure. They are the friends that you can call in the middle of the night, you can cry and be yourself, who will listen to your absurd ramblings without judgement…but then reel you back in when you start to go off the rails. Do you have this type of friendship? No? Then ask God to help you become that kind of friend. It is when you reach out and stand in the gap for another that a true friendship ignites. Standing in the gap for your friend. Like a bridge, connecting one side of the river to another. Be that bridge for your friend. I am blessed with great friends and I now count you as another. Your devotionals are wonderful and I’m glad you invited me to read them!